Setup creator software easily creates the setup of your program and helps in effective distribution of your software application. Windows software installation setup creator is specifically designed for the software developers and programmers who frequently faces problem like storage and distribution of their developed computer programs. Setup maker creates an effective small size and professional looking setup of any software that takes less memory space, easy to save and is easily downloaded or installed. 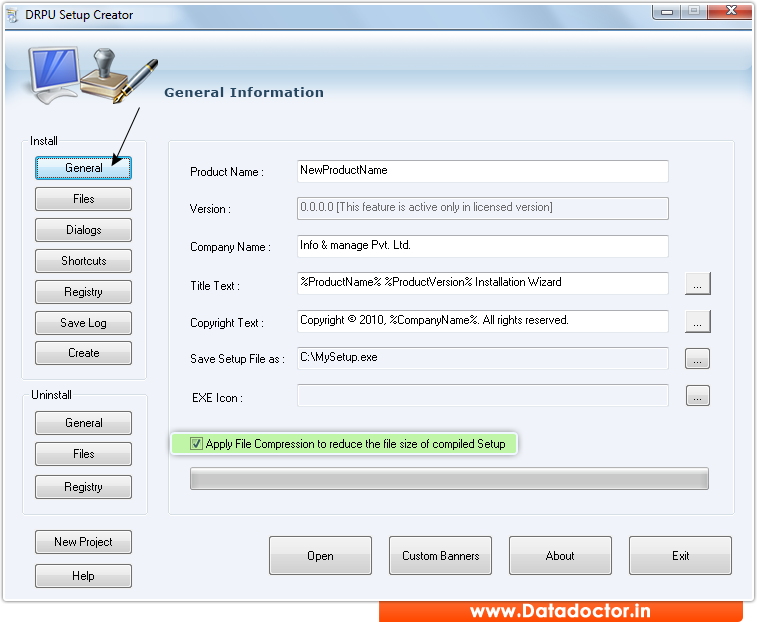 Setup maker software utility places all your executable and data files into single self extracting executable file format. Setup creator software easily makes the setup of the windows application software developed and coded in any programming language. Setup Creator even allows you to create desktop icons, place items in the Windows start menu program group, a file to be run on Windows startup. Setup generator tool has setup making functionality without altering the originality of your computer software. Setup creator software covers all the essential features and functioning of your software program and save your time on software deployment by creating installation packages. Data Doctor`s setup installation program has totally professional appearance and solution for generating software setup. » Setup creator tool deals with the entire functionality of the software and offers install and uninstall setup generating feature. » Provides the general, registry and destination path detail of your computer program. » No modification during the setup generation of application programs.